With nearly 25 years of expertise in product renewal and reverse logistics, let CoreCentric Solutions help you capture hidden value, increase customer satisfaction and strengthen your brand. 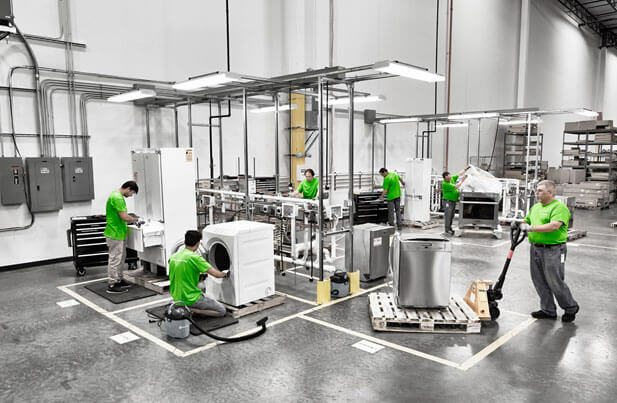 We partner with our clients to repair, renew and return to use appliances, appliance parts and consumer goods – bringing them back to better-than-original working condition in order to extend their lifecycle. Discover how our resourceful, solutions-oriented engineers reproduce non-functioning appliance parts, restoring them to better than when they first left the factory. We’re ISO 9001- and ANSI-certified, following the highest remanufacturing standards. Our industry-leading repair service teams go above and beyond simply fixing parts. We replace failed components as well as operational parts that may fail in the future – often in less than 48 hours – to ensure our clients and your customers are up and running as quickly as possible. We relieve the stress of companies having to manage product returns by skillfully handling the returns process from start to finish – helping our clients turn a cost center into a profit center. Managing the collection and storage of unused, expired or outdated parts and appliances is a challenge. Our Core Collection program can help you solve it. CoreCentric Solutions has been a leader in the repair, remanufacture and product returns industry since 1995. We keep appliances and products working for those who need them. Our trusted engineers provide inventive, custom remanufacturing solutions to the world’s largest retailers, extended-warranty providers and original equipment manufacturers (OEMs). We also provide exceptional service to parts wholesalers, service technicians and do-it-yourself consumers by quickly returning high-quality, rebuilt parts into the economy. CoreCentric Solutions Technology Office located in Pune, India held a volunteer event at a local orphanage. 28 team members delivered food and supplies to support a local orphanage with 100 children ranging in age from newborns to age 6. At its recent quarterly company meeting, CoreCentric Solutions celebrated a host of employees with perfect attendance and service anniversaries. These dedicated team members work tirelessly across in our production, supply chain and front office operations to ensure our clients’ needs are met each day. “CoreCentric Solutions” and the CoreCentric Solutions logo are registered US Trademarks and are the property of CoreCentric Solutions, Inc. Any other product names, logos, brands, and trademarks featured or referred on this website are the property of their respective trademark holders. CoreCentric Solutions, Inc. has no affiliation or legal status regarding these trademark holders, their products, or their websites.